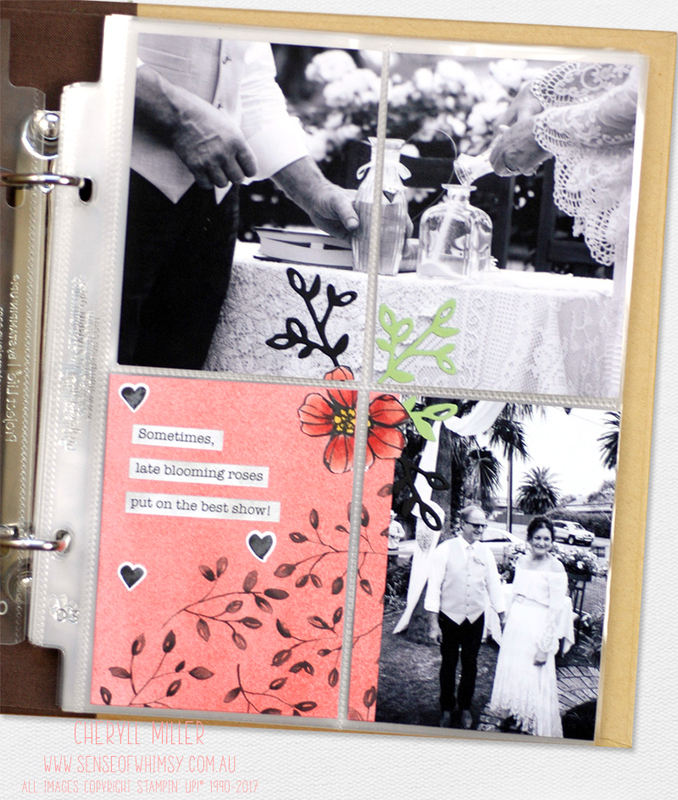 Hello and welcome to another Scrapbook Sunday Blog Hop. A fabulous team of demonstrators from around the world are showcasing scrapbooking layouts and pocket page projects using Stampin’ Up! products. Don’t leave your photos sitting on your phone or computer … get them printed and record your precious memories to share with friends and family. The full list of hop participants is listed at the end of this post. If you are hopping in order, you will have come from the fabulous Danielle Bennenk in the Nederlands. You are currently at the blog of Cheryll Miller in Australia. Todays projects will all feature shades of Coral, Green and Black, and I have chosen to create a 6″ x 8″ Pocket Page layout. I have used some of the black and white images from Duncan’s and my wedding ceremony, which was only a few years ago. For our wedding, the black and white images work the best as we were married in our front garden. We weren’t able to control the environment with cars, horses and curious neighbours making it a tough job for the photographer to get a distraction free background. 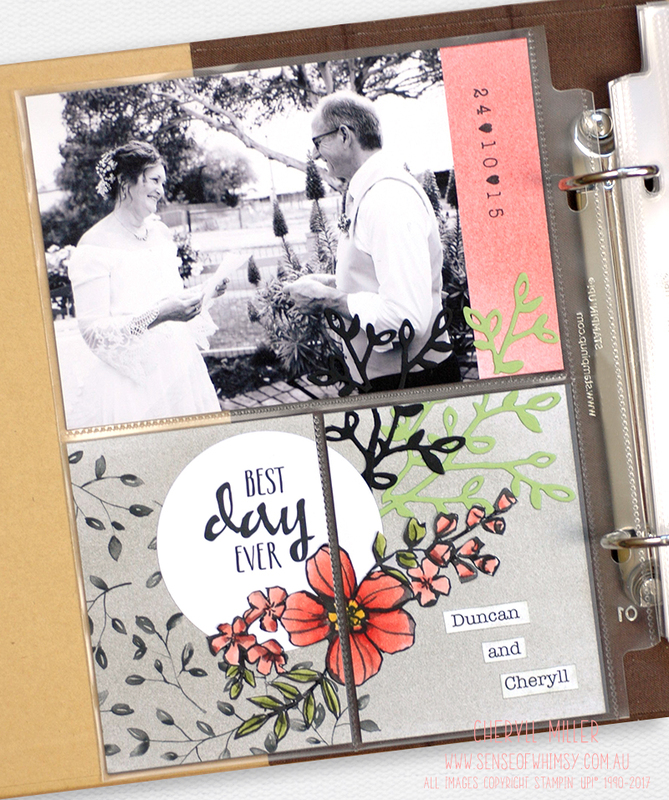 As I am relatively new to scrapbooking, I often utilise the smaller 6″ x 8″ album and pocket pages. I know that the pocket page style of memory keeping is meant to be quick and easy, however I end up putting as much time into these smaller layouts as I do the 12″ x 12″ pages. We took some white sand from my home state of Queensland and some darker sand from our local beach down here and alternatively poured them into a jar to symbolise our lives becoming forever intertwined. 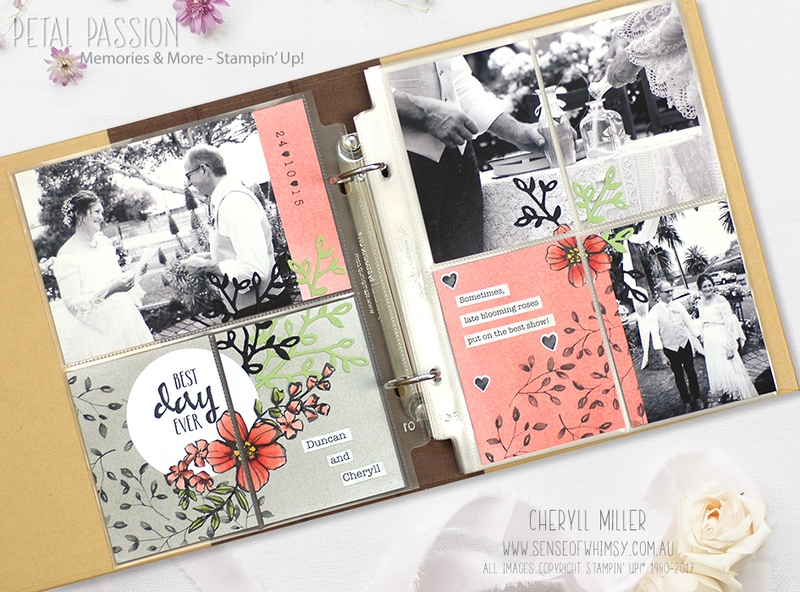 I used the Petal Passion Memories and More Card Pack and added the leaf sprig from Petals and More Thinlits Dies. 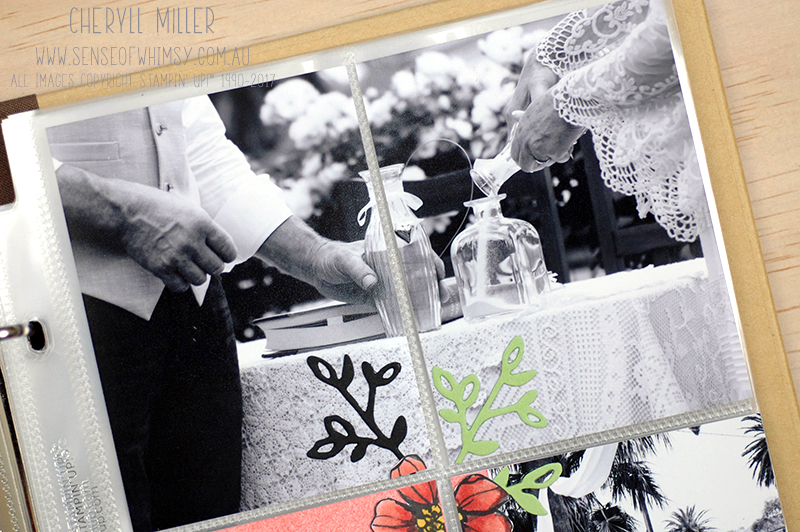 One of my favourite things with the pocket pages is splitting photographs between two smaller pockets, as I have done with this pic of our Sand Ceremony. For this layout, I also split the decorative panels. 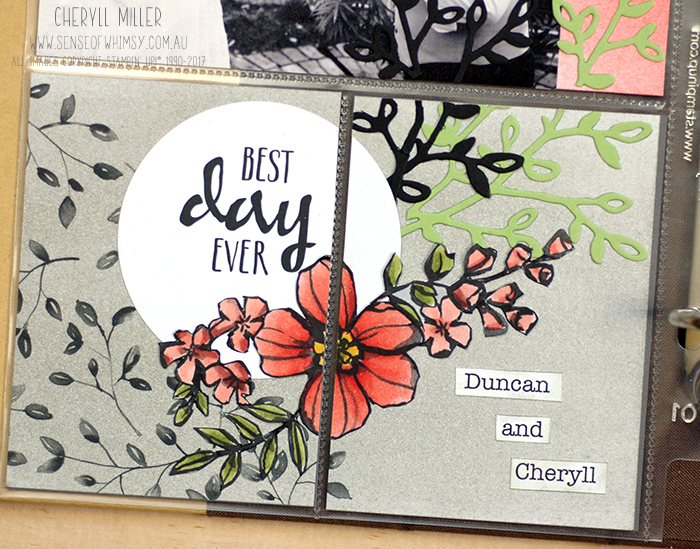 The heading “Best Day Ever” is from the Petal Passion Memories and More Card Kit, and I die cut it with a large Layering Circle Die. The floral images are the stickers from the same kit. 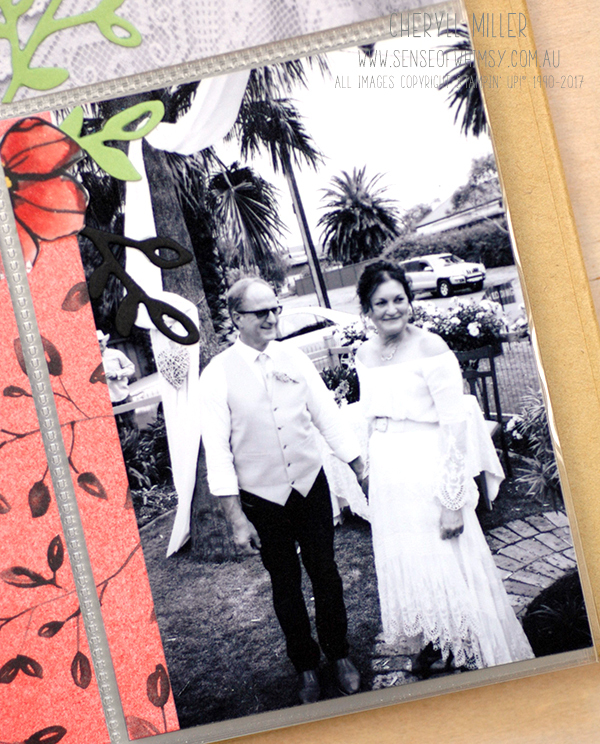 These come in black and white and I have coloured mine with Calypso Coral and Old Olive Stampin’ Blends. I did trim the stickers to remove the white border, however they look just as good with the white borders (see my project here). The 6″ x 4″ background pieces have been coloured with Calypso Coral ink and Smoky Slate Ink, using a Sponge Brayer. Calypso Coral in the Stampin’ Up! Palette is quite a strong colour, and I found that applying colour with the Sponge Roller allowed me to control the intensity of the colour. Splitting a 6″ x 4″ background between two pockets also allowed me to trim off some of the distractions from a photo, making it smaller than the pocket. And then because I didn’t want to waste all that deliciously coloured card behind the photo, I trimmed some off and used it behind another odd shaped photo in the top left pocket. 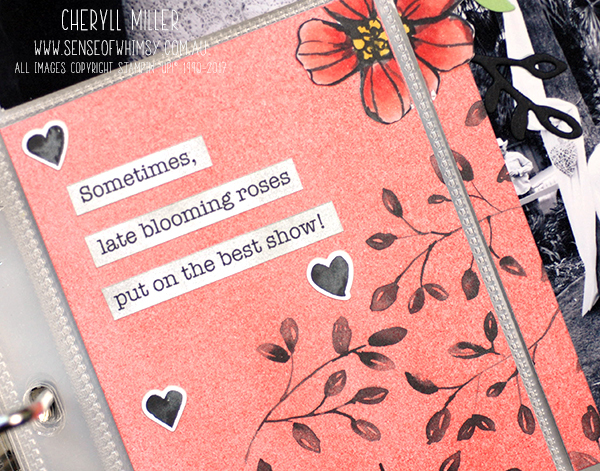 I used Basic Black and Pear Pizzazz card to die cut the leaf sprig from the Petals & More Thinlits Dies and used them on both sides of the layout for continuity, carrying the whole split pocket theme through over the entire layout. I am very much enjoying adding more memory keeping projects to my creative line up. Creating on an adhoc basis for these blog posts is also allowing me to let go of the feeling that I “need to get all my photos in order before I start” which is a major stumbling block for me. Doing one page or one layout at a time, just using what images I have already printed means I am building up an album of unrelated events and subjects, which eventually will be able to be sorted into a more cohesive order. And the wonderful thing is that these memories are running through my head the whole time I am creating the layout. Click here to go to the next blog in the line up and prepare to be amazed. Jenny Hall is next up and her work is an inspiration. And here is the full list of blog hop participants this month. Thank you for stopping by today and walking down memory lane with me. The list of products I have used is below and if you are in Australia and would like to purchase from me, just click on the product image to go straight to my online shop. Remember that for every $90 purchase, you get to choose a Level 1 item from the Sale-A-Bration catalogue for free. And a $180 purchase gets you a a Level 2 item (or two Level 1 items) for free. The rewards code for January is EJW4CJT2. All is so beautiful ! Bravo, j’adore ! Fabulous job! I am so inspired. I love how you cropped the first photos amount the pockets. I love it as you use this product series in project Life. I like very much! Beautiful layout to go with beautiful pictures. <3 Really nice job, Cheryll! Cheryl, Such a beautiful layout! Love how you really created a sense of flow with the pocket pages. Love how you made one element flow into another pocket to eliminate a distraction on a photo. Stunning as always, Cheryll! The split joining of the photos is genius!! I love how you carry over the patterns and colors from one pocket to the next by cutting your embellishments in a really clever way! And I totally understand you when you say these so called quick and easy pocket pages cost you as much time as the 12″x12″ pages. I experience exactly the same thing! Cheryll, love your pages! I should really do more pocket pages.. I forget that you can cut the pictures and make them fit anywhere.. they look fabulous! Your coloring is awesome on your “cards” that you created! Wonderful pocket lay-outs, Cheryll. Love how you created your own ‘cards’ and the colors.